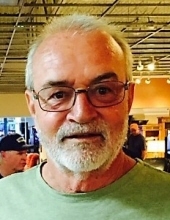 Steve Porter passed away in Nampa, Idaho on January 22, 2019. Steve was born in Sault Ste. Marie, Michigan on April 19, 1951 to Gerald and Twila Porter. His family moved to Pine Canyon, Utah in 1954. He graduated from Tooele High School and served in the Army during the Viet Nam War. He worked at the Tooele Army Depot until he transferred to the Corpus Christi Army Depot in Texas where he retired in 2006. He and his wife Patsy made their final home in Nampa, Idaho. He was preceded in death by his son Jamie and both parents (Jerry and Twila). He is survived by his wife Patsy; daughter Jannette (Randy) Martinez; son Joe (Angie) Howard; and grandchildren Jesley, Shylah, Hunter and Lilly; sisters Linda (Roger) Lougy and Cathy (Jerry) Overstreet; and brothers Gary (Lisa) and Rich (Phyllis). Private family services will be held. Arrangement by Zeyer Funeral Chapel, Nampa.208-467-7300 Condolences may be expressed at zeyerfuneralchapel.com. "Email Address" would like to share the life celebration of Steven Jay Porter. Click on the "link" to go to share a favorite memory or leave a condolence message for the family.